Size: Select 2 oz. 8 oz. Dr. Kirk's Scratch-FREEE Woodturner's Polishing Wax is a special blend of premium oils, waxes and ultra-fine tripoli abrasive that’s guaranteed to improve sanded surfaces by 4 times or more. Fast and easy with guaranteed superb results. Comments On Apr 18, 2017:Does a good job at removing small scratches. 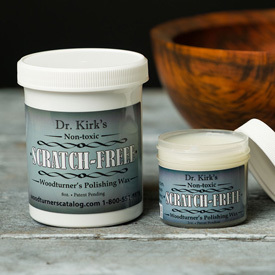 Before I put on friction polish I always use Dr. Kirks Scratch FREEE first. Comments On Jul 26, 2016:Dr. Kirk's Scratch Free Woodturners Polishing Wax is a great product. I use it during the final stages of sanding my items and the small minute scratches just seem to magically disappear. The good thing is that a little bit goes a long way. When needed I will be purchasing again. Comments On May 22, 2016:A fine wax for finish sanding then apply your finish - I have used this for the first time (about 8 small projects) and the finish was improved. Comments On Apr 28, 2016:I absolutely love this product. I use it in so many applications I would be lost without it. Comments On Dec 17, 2015:I use this product on wood and as a pre polish on Alumilite. Works great. Comments On Dec 12, 2015:Got it, used it, love it. Try it you'll really like it. Just follow the directions. Comments On Apr 09, 2015:After I ordered this I read on an internet forum that it would dull a CA finish. I didn't use it until I had one end of a pen I had completely finished that I didn't like and had set aside. Today I put it on the mandrel and polished it with Dr Kirks and it came out beautifully. It's that final touch that I've been looking for since I started turning pens about a month ago. Comments On Apr 13, 2015:I first found out about this product from Cindy Drozda's YouTube channel. I ordered it and was delighted with the finish it provided. When I applied it, I could see a few areas that had tool marks. Then, after I fixed those, I re-applied it to take out the small sanding scratches. It seems to be have a good ratio of beeswax and mineral oil, similar to what Eli Avisera makes for himself. If you are going to finish with some other product than shellac, the label advises you to remove excess wax prior to finishing. But if you are using shellac, it makes for a marvelous base. I like it better than EEE. Comments On Dec 13, 2014:I use this product on my Corian and Acrylic pens and it truly removes any tiny scratches before putting on the final finish. Works easily and quickly! Scratch FREEE Is RIGHT !!! Comments On Apr 11, 2014:Thought we would give this one a try and so happy we did !! This is one amazing product !!! Works great on all we do! We don't spend so much time on each item now.. a real time saver... a little goes a long way too. Thanks so much !! Comments On Jan 16, 2014:I use this finish for my final sanding. Never a micro scratch in my work anymore. I don't know how I got along with out it before. Comments On Nov 07, 2013:I've found that with a shelf full of wax's and finishes this is my go to product. Comments On Oct 07, 2013:Works nicely for me. Comments On Jan 31, 2013:I have been sanding my pen blanks out to 800, now using this product I sand to 400 and then polish with triple E. I like the finish it gives me and the time savings. Comments On Jan 10, 2013:Works great, and being non-toxic is a huge plus for my tiny shop in the basement. Also without the grit like other products it does not transfer stain off bushings to wood. Comments On Nov 15, 2012:This polish I highly recommend to improve your finish on woods or acrylics, after sanding to a 400 grit finish. I have personally used this product on many small items. This product I recommend to my students and fellow woodturners.Great value and time saver. Thank you for the excellent product. Comments On Oct 29, 2012:Dr. Kirks is a very good polish,very fine grit in a a non-toxic product. Does a beautiful job on pens. Can't wait to try it out on some boxes and bowls. Left a beautiful finish on all I used it on. Easy to use and does not have an odor like some other products I have tried. I recommend you give it a try. Comments On Oct 23, 2012:Just got a can of this in the mail today and quickly mounted a few pieces I had lying around to test it out. The results were great!! Nice, scratch-free shine and the can comes with a huge amount of it considering how much you actually have to use; it should last for years to come. Keep in mind that it is a wax, so it also coats the wood as it polishes so it somewhat limits your options for other finishes, that's if you still feel you need one after using this.